Tango originated in Argentina during the eighteenth and nineteenth centuries, and of course this was the Argentine Tango. It reached Paris ballrooms in 1909 and quickly became popular in England and in America prior to World War I. Vernon and Irene Castle were especially successful in popularizing an elegant and polite form of tango, and a craze developed for "Tango Teas," held at many fashionable hotels. Where International Tango is highly structured, American (like Argentine) is more loose. We make greater use of loose closed, semi-closed, banjo, sidecar, butterfly, shadow, even open position. We are apart from our partner more. On the other hand, when we are in closed position, the hold is a close one. His right wrist should be placed on the woman's left shoulder blade, the fingers and thumb together and pointing down her back toward the floor. Her left arm wraps around his right arm and the ridge of her hand presses against the lower side of his upper arm. She might try to lock her left thumb into his right armpit. Bodies are offset to the left so that left legs can swing freely past your partner, but you are close, tight at the hip. Both look to the left. Where International Tango emphasizes the use of quick steps and uses slow counts for contrast, American Tango uses more slow steps and uses the quicks for contrast. The basic timing is slow, slow; quick, quick, slow; over two measures. In most Smooth rhythms, we use the whole slow count to take the step. Movement flows steadily from one beat to the next. But in Tango, we take the step more sharply on one beat and then hold on the second beat. Place each foot and then stop; step and stop. There is no flow, no flight, no swiveling on the balls of the feet. In the other smooth rhythms, the body is always in motion, in smooth and graceful arcs. In tango, the body doesn't move past the foot. The foot and the body move together. When the foot stops the body stops. It is like a great jungle cat slowly stalking its prey. In Tango, we walk with a little right-side lead. The man steps forward on the outside of the left foot and rolls to the inside edge, on the inside of the right foot and roll to the outside edge. The steps are a little bit crab-wise and curved a little to the left. The right-side lead does this. Walk heel to toe, skimming the floor. Tango is sometimes described as the "Groucho Marx" dance because we flex our knees, and we stay down there as we move. However, you do not have to strongly flex your knees. Only maintain whatever degree of flex that you choose—there is no rise and fall. And above all, if you happen to think of Groucho, do not think humor, slapstick, or farce. Tango is usually pretty serious. You want to try to conjure up feelings of pride, distain, maybe anger. Put some passion into those fans of the leg, flicks of the foot, those flares, dips, and lunges. At the end of a slow count, when you are frozen in stillness, it is because you feel so intensely that you can do nothing else. This is not a Roundalab Standard, and we rarely hear it cued. Instead, we hear "walk two and tango draw." The basic can also be danced in banjo position. To make any forward step sharper, dance each "quick" as a q/& with the quick the step and the & bringing the free knee forward so you're ready to take the next step — step/knee, step/knee. This is not a Roundalab Standard either. The cue might be "walk two pickup tango draw." Tango Mannita begins in open position with walk two; pickup tango draw; and then into part A as described above. This figure allows us to do a tango draw from semi-closed position by incorporating a pickup-like action into the first step. To allow for the pickup, the man's first step will be shorter than in a standard tango draw. Again, we begin in semi-closed, but this time the man turns to closed. Since momentum will be moving the man back, his side step will be more comfortable if it is back and side, rather than straight side. Again, this is not a Roundalab Standard, and the round dance cue might be "back two and back tango draw." Notice that we have encountered two different figures that include a pickup and a tango draw. This figure is a walk, pickup, tango draw (pickup on the second step, before the tango draw). The promenade basic described above is a walk two, pickup tango draw (pickup on the third step as a part of the tango draw). As in the case of the promenade turning left, described above, we have two different sequences that include a maneuver and a tango draw. This figure is a walk, maneuver (overturned), tango draw (maneuver on the second step, before the tango draw). Alternatively, we might walk two, maneuver tango draw (maneuver on the third step as a part of the tango draw). This is a walk 2 (ss), tango draw without the "draw" (qq), walk 2 (ss), tango draw without the "draw" (qq), and finally a tango draw with the "draw" (qqs). Again, this is not a RAL Standard. It might be cued "walk 2 run 2 walk 2 run 2;;; tango draw;"
In brief, this is a walk two, run two, walk two, run two, tango draw, very like the continuous basic above. 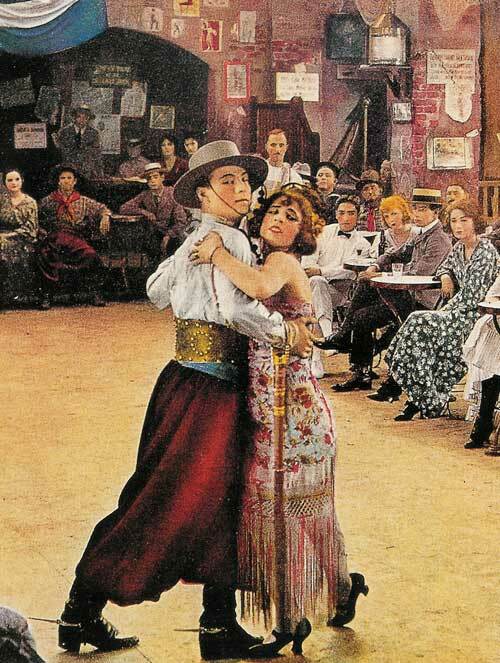 Above, we can see that the "tango draw" is a fundamental component in many american tango figures. The tango close is the same fundamental component, but it leaves the trail feet free instead of the lead feet. In brief, this extended figure is a pivot two, corte, recover, pivot two, corte, recover, tango draw. Note only two weight changes. This is also cued as a Flare. If you begin facing the wall with the man on the inside of the circle, he will stay on the inside of the circle. The figure may be danced in other orientations and with either foot free. From the right lunge position, step back L keeping R leg extended to side (she steps fwd R & lifts left leg up his outer thigh, her L toe pointed down). On the second slow, take a small back step to closed position.